While I was focused on the overall design and systems of the boat, Fay was focused on the interior and environmental experience. The core ideas for the interior originated in 2002 while we were bare boat chartering in Tonga. I had been investigating Trintella's when we came across La Rossa while anchored in the Vavau group. With cold beers as an offering, we asked the owners if they would mind talking about their boat. Four hours later Manfred and Renate had given us a thorough tour and several more beers. And our kids, who a few hours earlier were happily swimming and playing on a nearby island, were now shriveled and shivering as the sun was setting in paradise! 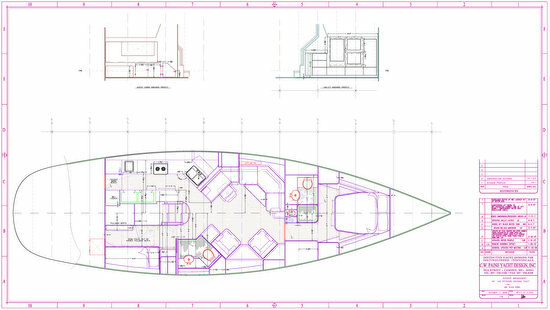 We came away with a strong sense of the interior style and layout that we wanted for our new boat. The two primary ideas we took away from La Rossa were that we wanted a hard dodger covering a spacious cockpit and a light colored airy interior. We decided upon a maple interior very early in the process. Then we reviewed probably another 100 boats at shows ranging from Dusseldorf to Oakland. Among the many things we took away from all those boats was our decision to have a single level of sole in the cockpit and interior. We felt this would make the boat feel more spacious, like carpeting a house in a single color rather than a different color in each room. We also thought it was keep us from tripping up our clumsy feet! And because we saw the cockpit as an extension of the below deck living space, we wanted them connected by a companionway that was more like a staircase than a ladder. Over time we also concluded that we wanted comfortable chairs below decks (as on La Rossa) for reading, watching movies and relaxing with friends in a more modern, less traditional nautical style. As explained earlier, we engaged Chuck Paine to architect the boat. Early in the process we discussed interior design and to his credit Chuck was quite frank about his lack of interior design skills. Chuck offered to introduce us to Jane Plachter who specialized in the interior design of yachts. Knowing how important it was to Fay to get the interior 'right', we met with Jane and subsequently retained her to design the interior layout. Using the Trintella design as a starting point, Jane incorporated an octagonal layout into the salon which set the framework for the overall design. The next step was to address the transition from the salon to the galley. Knowing that I would probably spend a lot of time at the nav station, it was also important to incorporate the nav station into the galley sight lines. While sitting at my home computer when Fay was pursuing her hobby of cooking, we decided we wanted to replicate the relationship between my home office and kitchen on the new boat. The aft cabin was a bit more challenging. The primary goal was to provide a secure and comfortable sea berth for the off watch. With a crew of two, only one person is off watch at a time and we can hot bunk with a single sea berth. However, we also wanted a space where two guests could have privacy and provide two sea berths when necessary. The Paine office came up with the idea of a pullman berth which would be stowed against the inboard bulkhead, under the starboard cockpit bench. When lowered, the pullman berth lays parallel to the single sea berth and provides either two sea berths separated by a lee cloth, or a single queen sized berth. To keep everyone comfy when the boat is heeled we've padded the inboard bulkhead and hull side with 3/4" of foam under Ultraleather. Sometimes we call it the padded cell! The galley is long with moderate sole width and designed to provide a safe working environment for the cook. 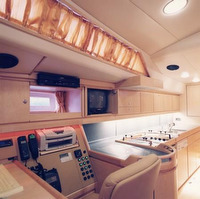 At the forward end on the outboard side is a counter area with a microwave above, stove to aft and a double sink forward. On the inboard side is another counter and just aft are the refer boxes. The cook can stand in one place and rotate to reach the stove, either counter, the microwave or the sink. There is ample storage under the counters, as well as a long row of under deck cabinets. At the aft end of the galley is a hanging locker, workbench and second sink. Two hatches, two dorades and three opening portlights provide lots of ventilation. The aft cabin, aft head, nav station and galley are arrayed in an arc from the companionway and provide the core below deck living area when underway. If conditions permit, we can use the salon and forward cabin, but if not we won't need to move far from the companionway. A feature in the salon is the pairing of two comfortable A. Rudin chairs that we found at the San Francisco Design Center. We spend a lot of time in these chairs when we're relaxing below deck. They face the settee, as well as a 30" Apple monitor behind the settee on which we can play movies, present our photographs and maybe even show a large version of our charted position when underway. A large central hatch provides natural light and fresh air. Fay accented the salon with table tops created by her sister Evy Rogers. These whimsical table tops will doubtlessly be the source of many late night ruminations! They also provide contrast to the maple joinery and we won't need to worry about using coasters. On the hook we use the forward cabin and the adjacent forward head. The design goal for this cabin came from a photo we saw in a product brochure. We saw it and said "we want ours to look like that! "; we put the picture in the specification and tried to design with it in mind. A center line queen berth dominates the cabin. To starboard as you enter there is substantial cabinetry for clothes, as well as a second cabinet to port and upper cabinets tucked under the side decks. Two large hatches provide lots of fresh air to flow back past the sitting chairs in the salon and out the companionway. There were two requirements for the forward head. The first was a dedicated shower so we didn't have to wipe down the walls after taking a shower. We got a dedicated shower, but on the small side. We augmented it with a hatch in the headliner to provide natural light, fresh air and a view of the sky. Fay also added a circular window, created by Vincent Taylor, which created an artistic piece for the forward cabin and makes the shower feel larger. The second was ample lighting for our aging eyes. Fortunately the power miserly LED lighting allowed us to have plenty of light, even as the portlight shrunk and eventually became fixed instead of opening. We tried to avoid endangered hardwoods, but unfortunately every one we spoke with recommended a teak sole. In the end we decided to apply teak veneers to a plastic honeycomb core (entirely encased) to save weight and reduce the amount of wood needed. From a design standpoint the dark floor hides the dirt, "anchors" the room, and provides a dramatic contrast to the maple bulkheads and furniture. Other materials include brushed nickel and brushed stainless steel hardware, hand holds, door pulls, and sinks. The counters and back splashes in the galley are CaesarStone while the heads have Corian counters and back splashes with integrated sinks. The interior soft materials are earth tones of Ultraleather on cushioned furnishings, ceiling, headliner and deck overhangs. The cockpit cushions are covered with fabric from Perennial Fabrics. Dish locker: this is located outboard of the sink in the galley. There is a drain at the bottom of the locker so wet dishes, pots, pans etc can go from the sink to the locker to dry. No dish drying! Refrigeration/Freezer: There are three refrigeration boxes in the galley. Normally two units provide refrigeration and one unit acts as freezer, but the system allows for any of the three boxes to be configured as a refrigerator or freezer. And any box can be shut down entirely to save power when it's not needed. Wine storage: The cabinet adjacent the aft chair on the starboard side of the salon contains horizontal wine storage for about 30 bottles, including a few bottles of champagne! Cockpit table: The cockpit table stows in a long narrow locker in the starboard side cockpit bench. Head cradle: A massage head cradle fits into the aft end of the forward cabin bunk. Workbench - located at the aft end of the galley with a SS work surface that keeps boat projects out of the salon. A removable section enables the workbench to be expanded for larger projects. Threaded inserts allow a full size vise to be mounted to the workbench. A second sink is located in this area to keep non food items out of the main galley sink. To see how the interior actually came out, see Billy Black’s photos.